Hugh Prentice, a junior partner in the law firm of Prentice, Prentice and Vaughn, was having an argument in his office with Helen Dean, his serious romantic interest. She had accused him of not being serious enough and of spending too much time reading detective stories and wishing that something like these stories would occur in his life. She said that he was wishing that a mysterious character named Omar of Ispaham would come to his office with a mysterious mission. Hugh denied this and said he must be going because he had an appointment to deliver some papers to the barrister Patrick Butler. The clock struck five and there was a knocking on the door. A short, dark man wearing a fez entered the office and said that he was Abu of Ispaham, and that he needed a private word with Mister Prentice. Helen took that as her cue to leave. Abu said that his brother's life was in danger, and he told Hugh that all of the dangers in his life were due to Hugh's gloves. Hugh left Abu in his office and went to the office of his fellow junior partner, Jim Vaughn, and asked him to keep and eye on Abu while Hugh delivered the papers to Patrick Butler. They had this conversation in the small space in the hall between their office doors. When Hugh turned to look in his office again, Abu had died of a stab wound. It was impossible for any one to enter the office without the lawyers seeing them. There was no place for any one to hide in Jim's office. This was essentially a locked room murder. Hugh left to seek help leaving Jim with the body. This was the beginning of Hugh's mad cap adventure. He sought the help of Patrick Butler, an extremely effective defense lawyer and an extreme egotist. These two would be joined along the way by Helen and by Lady Pamela de Saxe, a dumb blond, who was apparently Butler's current romantic interest. The beautiful Lady Pamela seemed to be much more interested in Hugh than Butler. Hugh's adventures would take him through a very foggy London to some very unexpected places before the solution of the puzzle would be reached. He went to the police museum at Scotland Yard, an antique shop at Seven Dials selling historical gloves, a theater with a magic show, and a hotel which was hosting a convention of the Society of Ancient Sins. This is a fun book which I enjoyed very much. 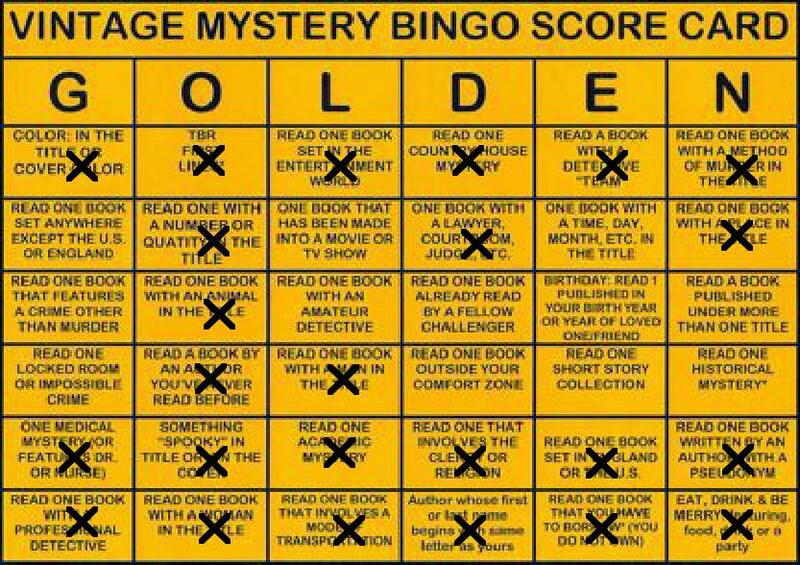 It does deal with murder and other crimes, but Hugh's jolly trip around London in the fog makes it quite enjoyable. 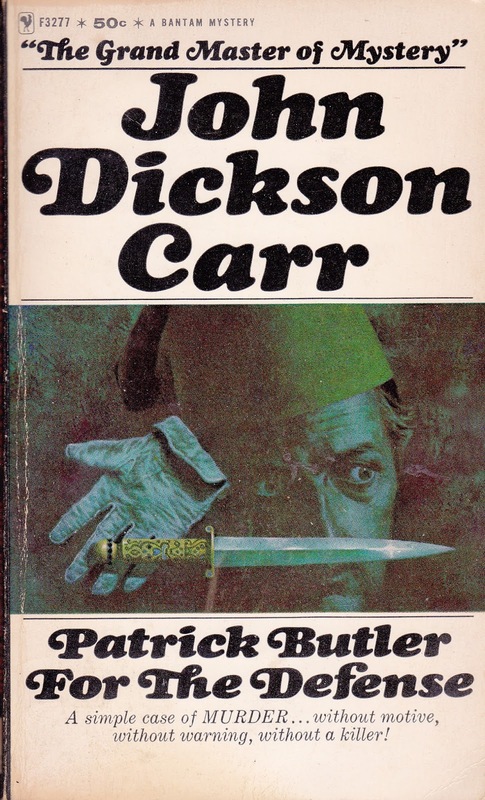 This book was written in 1956 by John Dickson Carr, the master of the locked room mystery. It is apparently no longer in print, but used copies are available online. 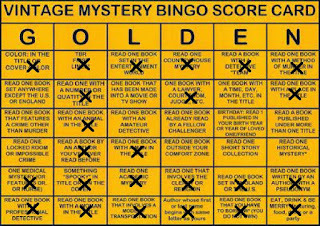 I have read this book for the 2015 Vintage Mystery Bingo Challenge in the category of a book with a man in the title.